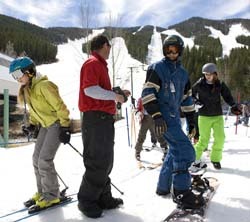 Sun Valley skiers and snowboarders have only three days left to enjoy the 2012-13 winter season on Bald Mountain. This week, Sun Valley Co. ran only two of its chairlifts, Challenger and Christmas. Currently, lift service is only available at the Warm Springs base. The River Run base and lifts have closed for the season. But a recent resort news release states that it plans to reopen the Greyhawk lift on Saturday and Sunday, depending on the weather. Stearns said the resort plans to keep 31 ski runs open through the weekend, also depending on weather. On the Warm Springs Side, all runs will be open except Brick’s Island and Upper Cozy. On the River Run Side, Ridge, Roundhouse Lane, Upper College, Cut Off, Lower Blue Grouse and Upper Blue Grouse should remain open. In the Frenchman’s area, Graduate and Upper Janss Pass should stay open. Seattle Ridge, the bowls and the adventure trails are closed for the season. Corn snow—created through a cycle of freezing at night and softening during the day until the snow forms relatively coarse, corn-like grains—is revered by skiers for its velvety texture. In ski jargon, the corn “ripens” as it softens, but there’s a sweet spot when it’s at its best. It can get too soft and slushy late in afternoon and be too hard and icy early in the morning. For more information on Baldy, including which lifts and runs are currently open, visit the resort’s Bald Mountain report at www.sunvalley.com/mountain/report. On Saturday at the Warm Springs base, Sun Valley Resort will host the last of this season’s free, springtime Rock ‘n’ Sun concerts. Spare Change will play from 2:30-4:30 p.m. The resort will offer food and drinks outdoors during the show.